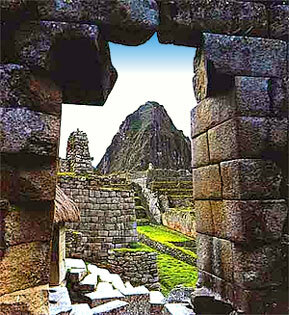 Machu Picchu Lost City of the Incas - Inca Geometry. 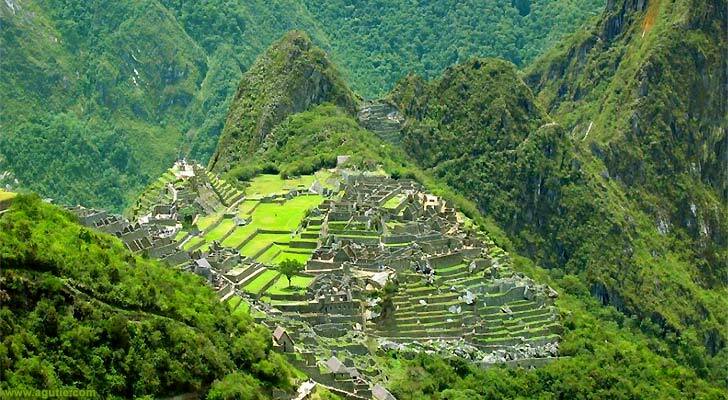 Machu Picchu, "Lost City of the Incas"
"Machu Picchu is a late Inca town dramatically sited on the saddle between two mountains, Machu Picchu (Old Mountain) and Huayna Picchu (Young Mountain), overlooking the Urubamba River, which winds 3000 ft below it. Its buildings, all constructed of local stone, use various types of walling, from coursed ashlar to roughly dressed rubble, and incorporate characteristic trapezoidal doorways. 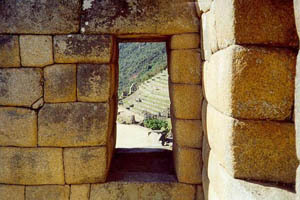 Some of the walls have rectangular niches formed on the inner side. Masonry gables still stand and some buildings have trapezoidal window openings. The steep slopes of the site are terraced with masonry retaining walls to hold soil for the gardens, and the various levels of the town are linked by stone stairways." Sir Banister Fletcher. A History of Architecture. p688. Machu Picchu is a pre-Columbian Inca city located at 7,970 ft altitude on a mountain ridge above the Urubamba Valley in Peru, about 44 mi northwest of Cusco. 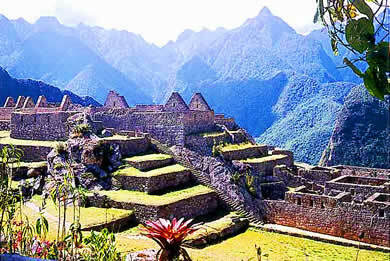 Machu Picchu is the most familiar symbol of the Inca Empire. 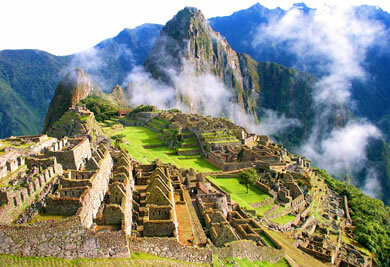 It is often referred to as "The Lost City of the Incas". The site was designated as a World Heritage Site in 1983 when it was described as "an absolute masterpiece of architecture and a unique testimony to the Inca civilization". Machu Picchu, which means "Old Peak", was probably built by Pachacuti Inca as a royal estate and religious retreat in 1460-70. The site is comprised of approximately 200 buildings, most being residences, although there are temples, storage structures and other public buildings. 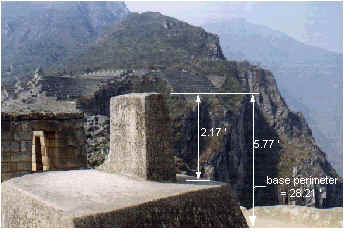 It has polygonal masonry, characteristic of the late Inca period. After centuries lost in the jungle of Cuzco, Machu Picchu was rediscovered in 1911 by the American archaeologist Hiram Bingham. The Inca trail to Machu Picchu is rated as one of the best trekking trails in the world offering stunning landscapes and ancient ruins with diverse ecology. until I reached you Machu Picchu. had never hidden in her sleeping clothes. rocked in a wind of thorns." The Intihuatana was used by Inca astronomers to predict solstices and was of great importance in Inca mythology and agriculture. 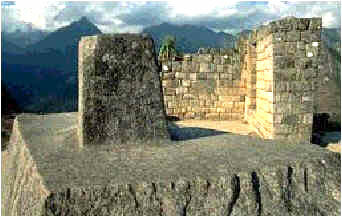 It is considered the most important shrine in Machu Picchu.